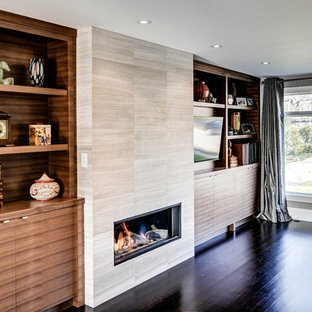 This is an example of a contemporary family room in Toronto with a tile fireplace surround. Inspiration for a mid-sized transitional enclosed living room in DC Metro with beige walls, carpet, no fireplace, no tv and brown floor. 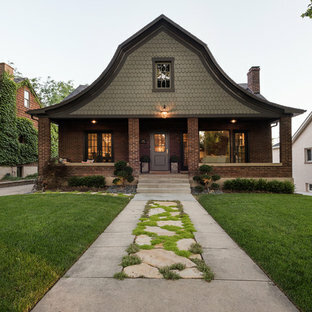 Inspiration for a traditional two-storey exterior in Salt Lake City with mixed siding. 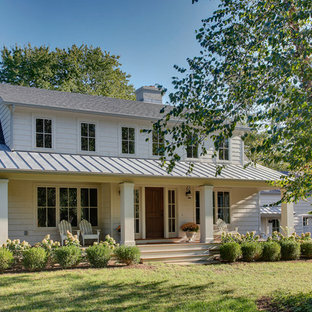 Mid-sized traditional two-storey white exterior in Bridgeport with wood siding and a gable roof. 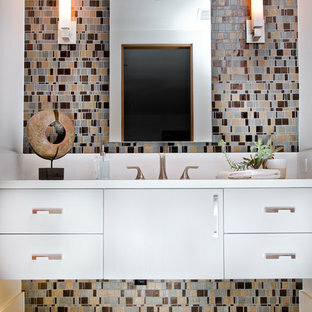 Inspiration for a contemporary bathroom in Orange County with flat-panel cabinets, white cabinets, multi-coloured tile, mosaic tile, white walls and brown floor. 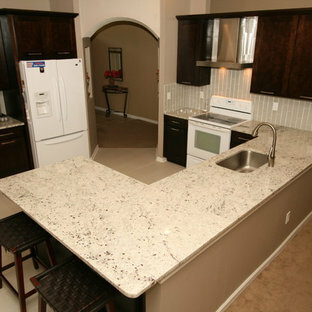 Mid-sized contemporary u-shaped eat-in kitchen in Jacksonville with an undermount sink, shaker cabinets, dark wood cabinets, granite benchtops, beige splashback, glass tile splashback, white appliances and porcelain floors. Inspiration for a mid-sized traditional u-shaped eat-in kitchen in Jacksonville with an undermount sink, shaker cabinets, dark wood cabinets, granite benchtops, glass tile splashback, white appliances and porcelain floors. The 1930s-era Tudor home fit right into its historic neighborhood, but the family couldn't fit all it needed for this decade inside—a larger kitchen, a functional dining room, a home office, energy efficiency. Photography by Morgan Howarth. Inspiration for a contemporary kitchen/dining combo in Dublin with light hardwood floors. Contemporary bathroom in Toronto with a vessel sink. This is an example of a contemporary living room in Orange County with white walls, a standard fireplace and grey floor. This is an example of a large traditional eat-in kitchen in Portland with stainless steel appliances, recessed-panel cabinets, white cabinets, white splashback, subway tile splashback, granite benchtops, an undermount sink, dark hardwood floors, multiple islands and black benchtop. By J.S. Brown & Co.
Photo of a mid-sized contemporary home bar in Sydney with light hardwood floors and beige floor.